ARF Bureau Chairman Hrant Markarian while being interviewed by Ararat TV. The ARF Bureau chairman Hrant Markarian late last week was the guest on Yerevan-based Ararat TV’s interview program, during which he discussed the party’s approaches to domestic and foreign challenges facing Armenians ahead of the December polls and offered perspectives on how his party approaches those critical issues. Below is the English translated text of the interview, the video of which is also featured. Ararat TV: With a few days left to the start of [snap parliamentary election] campaigning, what preparations are currently underway within the ARF and what strategies will be used to implement this unique campaign and elections? Hrant Markarian: We are going to campaign in a way that is specific to us. We will activate our ranks and our structures—organization—and due to the fact that the campaign period is extremely short, we are going to attempt to utilize all our organizational capabilities. The structure should work so that we succeed. In my opinion, only mobilization will succeed because using logical words in the next ten days will not create an atmosphere, the change the mentality, or persuasion [of the voters]. Ararat TV: You will not be competitive in the current conditions if you were to run a classic campaign. You are saying, a campaign typical to you [the ARF], does that mean that it will be the same as in previous elections? H.M.: Some think that the correct way to campaign is by only opposing [the current government]. Others think that they will reach a certain level of success by riding the highs of a large wave. But we are not going to proceed in that manner. We will clearly tackle our problems in a precise and direct manner for our people; and we hope that the people will treat us similar manner. The issue is that we have not been dealing with people in a [dishonest] relationship; we have not dealt with an unchanging system, fraud, and pseudo popularity. We have not been guided by that. We have said things that we have understood to be true; the people might not love it or like it. We have said that we should not give up. We have to say that we should not give up on Karabakh’s struggle, while also realizing that a very important part of our nation will not accept that because they have a child—a son—of military age. Ararat TV: Are you saying that we should not yield on the Karabakh issue because we are seeing clear challenges? Ararat TV: Until when will you be honest to those who elected you [the ARF], Mr. Markarian? H.M.: For the past 28 years, we have always been honest. And not only the past 28 years but for the last 128 years, and we will be honest until the end. There is no other way. We are different from all the other political parties in one area: the other parties have an issue with succeeding in right now; to be able to claim victory in the present, whereas we have an issue with continuous success. We should not do anything that causes the next generation—the next generation of ARF members—to feel ashamed. Ararat TV: Mr. Markarian, in this day and age is it not fashionable to be principled? You, yourself can attest to that. H.M.: We are so great that we do not follow what is vogue or fashionable. We are that great that we will only follow our national and country’s interests regardless of what is currently being assessed. Regardless of everything, we will remain loyal to our people, our country, our land, and Armenians. We will remain loyal because it that is the essence—gist—of our party. That’s who we are. We will not be doing everything to gain votes. We will do everything to do our best to ensure our people vote with their conscious. Ararat TV: Did people vote with their conscious during the Yerevan Municipal Elections or were those different elections, Mr. Markarian? H.M.: I think that during the Yerevan Municipal elections, the conscious vote was not recorded. Ararat TV: What hope do you have for the snap parliamentary elections? As in, what has changed in the past month? H.M.: Yes, I know that there is a danger that in the coming days, fake agendas will be created… There will be new arrests, the atmosphere will become strained, and that will take it to another direction. The issue is that this election is not the only goal in our lives. We may not have a good result today, but I’m sure, that in three months, six months, nine months or a year we will have good results. We are that organization: serious, loyal. We are not working for today. We are not working toward Armen Rustamyan becoming Prime Minister. That is not our life’s goal. Ararat TV: But our people like the announcements that are done on a whim, Mr. Markarian. H.M.: I think that the same people can judge who is serious, consistent, principled and stable. The people and the children of our homeland can recognize this. They criticize us and frequently say that we live in a fantasy world. But they respect us. They respect us because they know that we are patriotic; they know that we will never betray the interests of our people. They know that this is a serious and important issue and this is the greatest achievement that the ARF has had. That may not translate into a vote at any given time, but one day it will definitely become true and they know that we are serious in this issue. This is the most important thing, and this is the greatest achievement that the ARF has brought. That may not turn into a vote today, but one day it will definitely become a prevailing thought and influencer. Ararat TV: You say there will be more arrests. They will apprehend some people, and they will let some people go. For the authorities, the events of March 1  are under being magnifyed. Throughout this entire time, we are seeing multiple press releases, announcements from the head of Armenia’s Special Investigation Service, the Prime Minister’s announcements. In the beginning, [Nikol Pashinyan] announced that all will be revealed [in the March 1 case], but we have not seen a complete revelation. Is it possible that arrests will be made during this campaign? H.M.: I do not rule out that. It [March 1st] has become a subject of political manipulation. Ararat TV: And the most dangerous thing is that the people are supporting it. H.M.: Yes, a portion of the people do support it. But I think that with each day, a portion of the people has become worried, disgruntled, disappointed in what is happening in this country. Recently, on one occasion I said that we are seeing all of our people as criminals. All the different layers [of people] that have been subjected to unlawful acts due to circumstances, the situations or the atmosphere [in the country], were magnified and brought to the foreground, and used to intimidate people. If you are a village mayor, if you do not work in a certain manner, if you do not vote for this person, if you work with this force, only then will we work with you. If you are a school principal it is the same. A teacher the same. An official again the same. And this is an important issue for our people. What I’m saying is not for those individuals who have participated in large-scale robbery [to not be punished]. Naturally, none of the large-scale looters should be forgiven and everyone should be held accountable. Ararat TV: No one is imprisoned today, Mr. Markarian. H.M.: I know. In this respect, I have no issue. And as for March 1st, the problem is much more serious. Okay, how many years have passed since the events of March 1st, but our people are constantly being held hostage [to that]. The former authorities judged the current powers, the present [authorities are] judging only the former [authorities]. And this does not inspire belief that eventually what is actually the truth will be disclosed. The real information should be disclosed and that chapter [in our history] should be closed. The wound should be healed for the people. It cannot always remain a wound. It is a wound, but to cure this wound, you need another means of treating it. Perhaps the right thing to do is to appeal to an international independent body to conduct an impartial investigation and investigate not only Robert Kocharian but also Levon Ter-Petrosian, Nikol Pashinyan and all the perpetrators of crimes to be really held responsible for their crimes. And when the question is raised, accusations are made that contain many things in their interpretation, a subjective interpretation. It is surprising because in these accusations, today’s authorities view it as a crime and in another situation not a crime. These are the problems in which I think that the patience of our people is already being tried. Fortunately, during the March 1st events, we [the ARF] were not on either side. And we were the force that predicted the events of March 1st and tried everything to prevent them from happening in order to not sacrifice our country on a path of failure, but we did not succeed. We are not on this side, but we are also not among the guilty, but we have the expectation that finally the truth—the real truth—must be revealed. And the truth will be revealed only through an impartial judicial system. 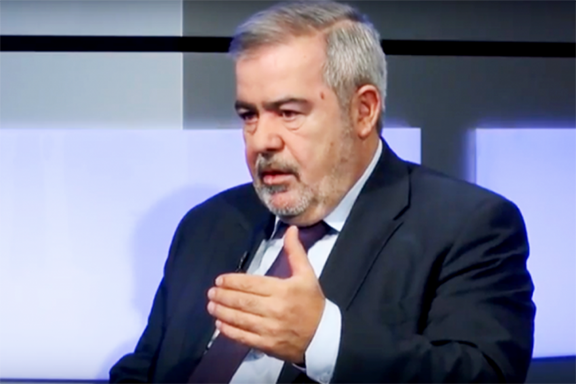 Ararat TV: Yesterday, on this same program, David Shahnazaryan [former National Security Advisor under Levon Ter-Petrosian] had the same thoughts, that an international body needs to be created to examine the information in order to inspire faith. In your statement, you said that revenge should not be taken using the events of March 1st. He [Shahnazaryan] also blames Nikol Pashinyan for using March 1st for his political goals. Do you agree with that view? H.M.: I have not watched the segment. Ararat TV: When you say revenge should not be taken using March 1st, what do you have in mind? Who is Nikol Pashinyan seeking revenge from? H.M.: I think Nikol Pashinyan is trying to use the issue and to use the circumstance for political reprisals. I’m saying that people do not believe in this judicial system. No matter how much Nikol Pashinyan wants to swear that he is not involved in the judicial system, but for me and citizens like me, it’s clear that if in a judicial system when 11 judges examine the issue of people who committed a crime and everyone is freed, but on the other hand, in a similar case that same judicial system reviews a case and nobody is released, it means that the judicial system is being dictated [in their decision making]. There may be naysayers, but this is the reality. The judicial system is guided by the fact that they [Pashinyan regime] say that they are not interfering, and as long as this is the case, no one will believe it. Nothing will be believed. And we need the truth. I am not interested in this issue; I am only interested in the fact that I want the truth to be revealed. I have not heard what David Shahnazaryan has said, but the logic tells me that the only thing, under these circumstances, that can reveal the truth and inspire confidence and thereby allow for this page to be closed forever is an internationally impartial, unbiased entity to be engaged for this issue. Unfortunately, we have not been able to create a situation where the events of March 1st are not only a situation where the previous [authorities] criticize those who are the current regime and the current [authorities] not judge their predecessors, not allowing for the truth to be disclosed. Ararat TV: Markarian, what external challenges are facing our country today? What are the threats? H.M.: That remains the most important question. Ararat TV: Karabakh, Artsakh’s issue? H.M.: Yes, but it stems from our foreign policy. In other words, what are we pursuing with our foreign policy? On the one hand, it seems that we pursue a goal to settle the relations between us and Russia on a logical basis, on the other hand, silently, but actually not so silently, to change orientation, to change sides, to stage a color revolution. These are the two most important issues. This is the question for me. I want to believe that the effort that is going on in order to correct relations with Russia and to build a dignified relationship—create a relationship that is in our interests—would be productive. That should be convincing in its logic. It’s a concern for me, I do not know, but I suppose it’s true, if I say that ammunition has not entered Armenia since May. Ararat TV: That is a very responsible statement. H.M.: Is that a condition that will affect the future of Karabakh, or not? We are a people that have been at war; we are a country that has been in war. Who is going to give an answer for this? Finally, the foreign diplomacy means success—success to defend our rights, success to defend our security. Is the foreign policy successful and am I able to see our interests protected? Ararat TV: Nikol Pashinyan says that relations with Russia are great. H.M.: They say [they are] great, but are they great? They [relations with Russia] are great, but no weapons have entered Armenia. They are great, but you can see that he has a personnel policy, which is completely anti-Russian. Until yesterday, people with anti-Russian sentiments have been appointed to key posts [in government]. I am not saying that we should be in give up hope over relations with Russia. No, no. A person in my organization [ARF] cannot say anything along those lines. We are not convinced of that being the truth, but we believe in one thing: are our [national] interests protected? I’m not talking about Russia’s interests, I’m talking about our interests. If we are aiming to correct our relations with Russia and are paying for it: we send peacekeepers to Syria, we allow the Russians to come here and purchase American companies. We do things that are characteristic of a subordinate, and not an equal. On the other hand, we send four doctors to participate in NATO exercises; where are our interests in these? I don’t know. These are illogical steps. [In] the CSTO case, even though the President of Belarus and the President of Kazakhstan are unfair, wrong and incorrect, no matter how much we say it, but are we able to succeed there? Diplomacy is the realm where we are able to advance our interests, not create conflicts. By creating conflicts we are creating difficulties to further Armenia’s interests. Diplomacy, politics, is the means by which we must be able to succeed. I’m starting to suddenly even think maybe the conflict is deliberately created because perhaps the final goal is to move toward the West. It’s not unthinkable for me—it’s not taboo—but when we are crossing fields, we should not change horses. We are at war. We need to know the answer to this war. Let me add that the West will extend hand to us by using Turkey. H.M.: How else are they supposed to do it? They will be using Turkey to extend a hand to us. One time I told the [former] United States Ambassador [to Armenia] that we are not an anti-American side, but due to the fact that the hand that you extend toward us is Turkish, we will not be able to shake it. Ararat TV: Mr. Markarian, when Bolton came to Armenia he said that the snap parliamentary elections will resolve all the existing issues. Speaking from past templates [of diplomacy] it is also a great time [Bolton said] for the conflict to be resolved. As in, in line with your worrieds, what future awaits us after the snap elections? Let us make our conclusions. H.M.: It is not a coincidence. Bolton’s statement was not a coincidence. A few months ago when there was still nothing happening [in terms of a call for snap elections], the United States ambassador spoke to political forces and said that we [US] do not understand why you are not holding the snap parliamentary elections immediately? Isn’t that what the public is requesting? He asked. Before [the snap elections were] called by the political powers or the public, that was the idea of the US Embassy. This is an extremely important issue. I do not know why the December 9 elections must happen so hastily. Hopefully, this is justified by the fact that day-by-day Nikol Pashinyan’s ratings are falling. So, the sooner the election [is held] the better the outcome will be [for him], because he sees that there is no positive change in the economy and that change will not occur in the coming months and we will have a difficult winter. So, [Pashinyan] scheduled it in December so long as the wave [of popularity] is at its highest and he can record good results. Hopefully, that is the only reason [for the snap elections]. But I have serious reasons to worry about us facing difficult days [in the future]. We will have difficult days. In my previous interview, I spoke about the Nakhichevan border. I know that [Pashinyan] is active, often going to Artsakh, visiting the soldiers, and making great speeches. Ararat TV: But we are forgetting about the Nakhichevan issue. H.M.: All of this is not putting a soft pillow under my head because I also see the serious dangers. One of those serious dangers, as I said before, is not receiving any weapons since May. Another serious danger was the statement made by Bolton. The real danger is that currently the situation in Nakhichevan is not good. This is a serious concern. God, I hope that I am wrong but I do not have the right to sit back, fold by arms and sit idly because while I can respect the views of 70 percent of the people, but the Karabakh issue is the meaning of life for me. Ararat TV: It is our security issue. H.M.: And we as an organization will not allow for Karabakh to pay the price for the change in political direction. We will not allow for a color revolution, as was the case in Ukraine, which paid the price with Crimea, and Georgia with Abkhazia. [We will not allow] for Armenia to pay the price with Karabakh. We will not allow for that to happen because Karabakh is much, much more important to us than Crimea was to Ukraine, or Abkhazia to Georgia. This is a matter of our existence. I am saying it again, I pray to God that I am wrong and all of my premonitions will not become reality. But I do not have the right to fold my arms and sit. I must be vigilant, aware and alert. I must be proactive. I must be careful and by providing good advice not allow for what we deem would otherwise happen. When I was speaking with Nikol [Pashinyan] when he was in jail [on April 22], I said that we should not pay this price [with Karabakh]. Ararat TV: And what was his response, if there was one? H.M.: He agreed with me. I cannot deny that. I hope that he agrees with me today too. But in his [future] steps must use that same logic. He must have a personnel policy, make political gestures, have political relations tactics, and they must be in line with each other. Otherwise, everything will be artificial. Ararat TV: Mr. Markarian, is it a fact that there has been no weapons supplied since May? H.M.: According to the information, as far as I know, yes. Ararat TV: Thank you, this was a serious conversation, but having serious problems we must speak about them. H.M.: The state of the country is bad. So the difficult conversation is more realistic.